When the weather outside isn’t the best for outdoor activities with your dog, you’re going to need an outlet for all that energy that’s normally expended in running and playing outside. The following ideas are great for keeping your dog happy, entertained and expending energy in a healthy way. A simple game that can provide lots of entertainment for both you and your dog. Start by leading your dog to their bed or another room and make sure they stay there for a few moments. You can either leave a treat or favorite toy to distract them if need be. Then find your hiding space and when you’re ready, call your dog’s name to signal them to come find you. Their natural curiosity will ensure your dog uses their natural abilities to sniff you out as they dash around the house looking for you. When they do find you make sure you react surprised and happy, providing a “reward” for them finding you. By reacting this way you teach your dog the rules of the game and give incentive for playing again. Consider having treats on hand if you want them to really enjoy the game! When you can’t go outside and play with your dog, take the opportunity to teach them a new trick. A good start is to run through the tricks your dog already knows how to do first. This lets your dog know the routine so when they see something new, they understand there’s a reward for successfully completing the new trick. After you have built up a nice repertoire of tricks with your dog, try running through all of them in quick succession. This can be a fun and fast paced game as you mix the order of the tricks each time. Going through them quickly and rewarding your dog will keep them happy and will reinforce the commands and knowledge of their tricks. Some of the most common and easy tricks to teach are sit, stay, down, come, speak, shake, and roll over. Once you master the basics you can get into the advance stuff like playing dead and waving. Your dog is great at sniffing stuff out, especially their toys and treats. Take this opportunity to make a game out of a natural talent. If your dog has a favorite toy you can be sure they know exactly what it smells like and how to find it when they want it. For a little bit of fun, take their favorite toy and make sure your dog sees you take it. Then go hide it somewhere in your house and excitedly tell them to go find their toy. Your hiding spot doesn’t have to be hard; under the couch or on your bed will be about right. Another way to enjoy the game is to hide their favorite treats inside simple puzzles for them. Consider putting a treat under an overturned cup or wrapping up a blanket with a treat inside. As they know a delicious treat is waiting for them, your dog will love to dig and find their reward. 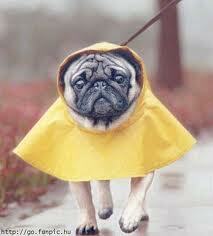 As you know your dog the best, feel free to make up your own game to turn your rainy day into a dog day!